The current lesson of the Mindfulness-Based Stress Reduction course that I am completing includes the mountain meditation. It is a guided meditation with visual imagery. First, the mountain is visualized as strong, beautiful and subject to constant change and harsh conditions. After this, there is the invitation to visualize oneself as the mountain, to internalize this image of an integral whole that includes both flux and stability. We are subject to changing conditions and the passage of seasons on the outside but our insides stay firm and whole. It’s a strong image and one that also brings positive associations to me because of my love of the mountains in the area in which I live. I do know, however, that mountains change from the inside out. I remember when Mt. St. Helen’s erupted. It was May 18th, 1980. I also remember the date of my breast cancer diagnosis. It was May 24th, 2012. In my life, I am an astute observer. I see what is happening around me. I can anticipate many things headed my way. I protect my exterior. There is something about the discovery that there is something working to destroy one from the inside, where it cannot be seen or felt, that turns life upside down and calls into question one’s own sense of being a solid self. Identity is something that consolidates after adolescence but it is subject to some changes over time. We often ask ourselves questions. Am I a good person? Am I a good spouse? Am I a good parent? Being good enough is hard to determine. There is always room to be better. It is not an absolute and goodness is multi-faceted. In respect to being good spouse or good parent, it also depends to a certain extent on another person. My parenting abilities depend somewhat on what my child needs and what she is able to provide for herself. I can’t define being “good” at a relationship solely on my own terms. The fact that I have been a person, a friend, a mother, and a wife will always be true, just as Mt. St. Helen’s used to be a beautiful symmetrical peak. There are things about each of us, very important things, that will always be true. One of my favorite classes while an undergraduate at the University of Washington was, “Ideas in Art”. We learned about visual art from different time periods and cultures along with the poetry and philosophy associated with each culture and time period. One of our required reading for the part of the course that covered the early modern art era in Europe was Marcel Duchamp’s, The Green Box. Duchamp was one of the founders of the Dada movement, an avant-garde style that stood with one foot in the absurd. “Dada” after all was named after the babbled phonemes that infants make before they learn to utter full words. Each of the 320 original Green Boxes contained 94 scraps of paper, notes, sketch studies, and more. What we read was an English translation of these items. The Green Box contained a lot of information about Duchamp’s approach to art. He was a painter, sculptor, and art discoverer. Examples of the last category was his “readymade” art. This consisted of a manufactured object that made into art by calling it art. The infamous of Duchamps’ readymade art was, Fountain, a urinal that he displayed upside down and signed with the pseudonym, “R. Mutt.” Duchamp also made modifications to readymade objects, which he called, “readymade aided”. As you might expect, the art world was not greatly enamored with Duchamp’s readymade’s, aided or not. Duchamp was provocative, to be sure. But he was trying to test the meaning of art with absurdity and to make his own meaning for art by using found objects. Aesthetics are, after all, highly subjective. A lot of my experience of breast cancer has been about making meaning of it. I know that as a psychologist, this is a common process in dealing with loss, grief, and for many but not all of us, trauma. Meaning, however, is not something that has already been manufactured; it is a process. Maybe that is a piece of the resistance to labels like “survivor”, cancer metaphors like war, or traditions like wearing pink feathered boas. I have also seen the tradition time and time again of resisting all established traditions by attempting to make a new paradigm. Cancer research and treatment needs objective standards in order to make discovers in a systematic way and to deliver treatment in a way that makes objective sense. This doesn’t mean that everyone is treated the same but the focus is on standards and protocols. And the things that people consider “unscientific” like rapport and responding to a cancer patient in an emotionally competent manner, are not unscientific. They are included in the science of psychology! The meaning I make from breast cancer, however, is more about my individual identity. The meaning is subjective; it’s personal. Psychology can study the typical course of grief and loss and it has. I can read about the process and it may help me understand what I am going through. But I still have to go through it. I have to experience it for myself. There will most certainly always be labels in our culture. To have no labels would make any chance of shared meaning and connection impossible. But labels, used inflexibly, like cookie cutters is not healthy. Language and labels are dynamic because cultures are dynamic. And within every culture, we have many individuals. In my professional life, I provide information and guidance based on objective research and my subjective experience. A gift of my blogging is that most of the time, I only have to speak for myself. This is a vital part of my self-care and healing. Just as there are many types of art, there are many types of people. Personally, I prefer to go to museums that feature more than one vision. Before we became cancer patients, we were individuals. There’s no reason for us to stop now! The objective similarity among individuals who have been diagnosed with breast cancer is that we have all been diagnosed with breast cancer at some time in our lives. The meanings can differ but still exist as truths. Last week I dreamed about my kittens. (Yes, I know, despite my formative years as a “dog person”, I have become a “cat lady” in my middle age.) My kittens are litter mates, brother and sister, both with pure black coats. In my dream, they were conjoined twins. People looked at them and remarked, “Oh, look at the cute kitties!” Then the heads of the kitties started looking in different directions and the front right and left feet did the same. The kitties looked distressed. They were not working as a team. When I awoke from the dream, I thought, “I need to use this image in a blog post.” Yes, really I did. As I’ve mentioned in the past, I am not someone who makes fancy dream interpretations. But I do think about my dreams, especially when I think they signal distress. At the time I was having the dream, I was concerned that John and I were not parenting as a team as well as usual and that we were having trouble communicating about the logistics of our lives. I think that is probably what the dream was about. I have been pretty stressed during the last couple of weeks. I am an energetic extrovert. Nonetheless, I don’t function well if I am pulled in a hundred directions, living a fragmented life. I am not good at perpetually switching gears. That’s one of the reasons I was attracted to pursuing a research career rather than a career as a clinician. Clinical work means switching gears between people, situations, and goals, quite frequently. When I did research, I worked on one or two projects for years at a time. But I ended up being a clinician and thank goodness, I learned how to switch gears much better than I did previously. Right now my workdays consist of switching constantly among work, driving my daughter around, getting to my healthcare appointments. My daughter has needed to be driven to one to three locations all around Seattle, every day, starting in the middle of the day. She takes the bus when she can but there are logistics to be worked there there, too. Yesterday, I reminded her of what time she needed to be home from school (she is volunteering each morning to help with a band program for younger kids) so that I could take her to an activity at 2:00 pm in northeast Seattle. (We live in southwest Seattle.) The original plan had been for her to take the bus downtown and then take a transfer to get to the office. However, we’d tried that the day before and she missed the bus. Since it was mid-day, there was not another bus for an hour. I cancelled my annual physical so that I could come home from work and drive her. Seattle is not an easy city in which to get around. It is long, narrow, surrounded by water, and hilly, for starters. This means that there are a rather limited number of highways and streets available to get from one place to another. If you are a long reader of this blog, you will know that I live with some rather forgetful people who actually need frequent reminders, even if they are not always happy to receive them, in the moment. And by the way, it is not enabling if your child is actually getting better at remembering these things on her own, which is the case for her. But she is only up to remembering these things about 50% of the time. Think about what your daily life would be like if you were not where you were supposed to be with the what you needed, half of the time. Also, you carry your bus pass in an old eyeglass case and your money in a ring box. And this is a major improvement in organization from years past. Finally, you don’t drive. See, having a nagging mom would be annoying but handy. About two paragraphs, I was telling you about one example day. Then I veered off course. What you don’t know if that while I’ve been writing this post, I’ve stopped and started it many times. I actually wanted to write it last week when I had the dream. Right at this moment, I am fighting the impulse to walk out and investigate the bird sounds I am hearing. When I am switching gears too much, coordinating multiple goals, I find that it is hard to stop switching gears. I find even more goals and they aren’t priority either. Instead of being a two-headed cat, I turn into a creature with an ever changing number of heads, all on one body. There is effort to do things but none of the cohesion required to get things done in an efficient way. There is an expression that people use referring to feeling “centered”. It is a positive thing but honestly I can’t exactly articulate what it is. But what I can tell you that at this time, I don’t feel centered or “grounded”, another common description that people use to refer to a state of balance. I don’t feel centered. I don’t feel grounded. I feel like I have an infinite number of heads and none of them contain good working brains. Now, these are subjective feelings. In reality, I am functioning. I am carrying out my life with competence. But I feel icky in the process. My natural inclination is to think of the happy, balanced, reasonable, bright, organized, empathetic, and energetic version of myself as “the real me” and the other times are aberrant. I am becoming increasingly, aware, however of how unreasonable this belief really is. I am always me. Who else would I be? The person who gets irritable with her husband because she is overwhelmed and fragmented? That’s me. The person who asked her husband to take care of a responsibility this morning because she was exhausted, even though she’s been irritable with him? That’s me. The real me is not that perfect and it is unhealthy for me to maintain a vision of myself as needing to meet that standard in order to be “real”. The person who is feeling a little more grounded and centered after having sorted through her thoughts and feelings while writing this post? I have goals in my life. Some day, my life will end. But my life, itself, is not a goal or an end point. My life is an experience, with lines of continuity as well as flux. Glen Webb was also the second person I’ve encountered in my life who comported himself with balance, an incredible calm, and peacefulness. (The first was Archbishop Emeritus of Seattle, Raymond Hunthausen.) Glen Webb was also a Zen Buddhist monk. He had followers in Japan. Connection threatens identity. Identity threatens connection. If you ask me who I am, I will tell you, “Elizabeth MacKenzie.” (And if you have a pencil in your hand, I will note that it is “M-a-c” and that the ‘K’ is uppercase. But if I really think about it, my name says very little about who I am. My name is not my identity. My name merely identifies me. That doesn’t mean that my name is not important because it is important to me. I am cancer, it is a part of my life whether it ever returns or not. I am a cancer survivor if I think of it as a process rather than an end point. I am a cancer survivor until I die, whether I die from cancer or not. I am a psychologist until I die. I am a mother until I die. I am a wife until I die. I am a friend until I die. I am that but I am not just that. I am so many things. I dreamed last night that I packing up to leave my office at the University of Washington because I’d run out of grant money. That actually happened in 2007. I thought I was all packed and then found a bunch of cabinets full of things yet to be packed. I realized I had a plane to catch to go home to Seattle. I walked around the university campus and it was actually the campus of Indiana University. The University of Washington is in Seattle. Indiana University is in, you know, Indiana. I walked around campus trying to get someone to help my move my remaining boxes before I was due to get to the airport. A couple of men offered to help me. I finally realized that I could not be in Seattle and Indiana at the same time. And how was I going to transport all of my office stuff back home and still make my plane. And then for some reason, the men and I walked into a building. The building exploded right as we walked up to the doorway, but some how we survived. Then I woke up. In the dream, my assumptions about where I was, what I was doing, and how I was going to do whatever it was I was doing, exploded right in front of me. We live our lives according to assumptions. Those assumptions can be challenged in gentle but persistent ways. They can also be thrown on their head. Then the assumption of health that supported all of my future life plans crumbled. I have worked to pick up the pieces, make new pieces, and reworked the foundational assumptions I have about my life. And all along, I have worked to be true to the person that I was before and not define myself only by fear and insecurity. The early part of this process focused on physical reconstruction of pieces. Surgeons have subtracted and added in many iterations. When I was home following my mastectomy in August 2012, I was looking on Ebay for clothes. I had lost a considerable amount of weight and I do nearly all of my clothes shopping online. I came across this photo. 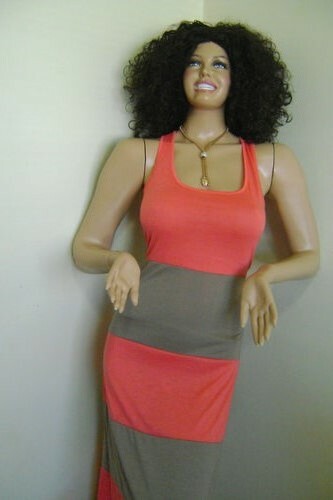 The mannequin pieces do not fit together and the arms are placed on the wrong sides of the body. It makes the whole figure off. The large hands in particular reminded me of how drag performers can look. They have many feminine physical characteristics through make-up, body padding, binding, falsies, and good acting skills. But there are almost always clues. Things that don’t look quite right. Some drag performers take advantage of this to comedic effect. Grady West, who developed the character, Dina Martina, is a 50 something year old man with a pot belly and hairy back. He wears over the top feminine glitzy costumes that are several sizes too small and his dresses don’t zip up all of the way. Dina’s make-up makes Tammy Faye Baker look like a model for Pond’s cleansing cream. He uses the mismatched puzzle pieces to great advantage and his shows are hilarious. Other drag performers aspire for “realness”, to be able to pass as a real woman. I was introduced to this concept when I saw the excellent documentary, Paris is Burning, which was filmed during the mid- to late-80’s in New York City. It was about the “Drag Ball Culture” in the city. (Remember “voguing”? It started there, not with Madonna.) I was fascinated by the communities that were built by the men in this culture. Most of them had been rejected by their families and by society, as a whole. But they made their own families with “drag mothers” and familial living situations. I thought the way that the men found a way to pick up the pieces and make news pieces to construct their own families was inspiring. I know that there was a short time after my mastectomy when I was worried about “passing” for a real woman. But mostly, I have been trying to reconstruct the pieces of my mental life and to dance to the changing rhythm of my daily life. Life has pieces that change. Life has pieces that need to be replaced. Life has pieces that are lost and cannot be replaced. But my life is whole and I belong here. Teller (politely): I’m sorry ma’am, we now require picture ID to make cash deposits. May I see your driver’s license. Customer (annoyed): I never had to do that before. I don’t want to do this every time. Can’t you just use visual recognition? T: I’m sorry, ma’am but I don’t know you. C: But you gave me two piggy banks last week! T: I’m so sorry. I’m new and I have not learned everyone’s face yet. C: How long have you worked here? T: I started at this branch in December, ma’am. C: By my recollection, you’ve worked here five months! Did you work here intermittently? The customer left having taken 10 seconds to produce photo ID and far longer in first arguing with the teller and then using up time to prove her wrong that she was “new” to the branch. I said nothing. It would not have done any good. I suspect that having the inconvenience of digging her ID out of her bag every time she made a cash deposit was not the issue. She wanted to be recognized. She wanted to be seen, to be important, and to matter. We all want to be recognized from time to time. Having cancer can be a challenge to one’s identity. It can impact us in different ways from person to person and change over time. Treatment can be so physically, emotionally, and spiritually altering that it can be hard to recognize oneself. A lot of us dislike the pink ribbon culture because we don’t recognize ourselves in it. That is the biggest disconnect for me because the corporate presence has made it about making money, not about breast cancer. Other associations are murkier. For example, many people do not like the war metaphor in fighting cancer. For others, it rings very true. I don’t have strong feelings about it as long as the metaphor is used as a coping strategy that makes sense to the person at the time and is not used as an explanation for why some people die from cancer and some don’t. Coping strategies should not be used to blame people for dying. Coping strategies are ways to make the best of a bad situation. A lot of people do not see themselves represented in the breast cancer research, especially as reported by the media. A lot of people feel like research findings are blaming people for having gotten cancer. I have a hard time with that. I don’t feel blamed by research but then again, I was a researcher for many years. My particular case of breast cancer fits some research on risk factors. For example, I have a history of obesity and did not breast feed until after I was age 30. I understand the evidence against women under 50 getting mammograms and even agree with it. However, I was 46 and invasive cancer was uncovered by a routine mammogram. I did monthly self exams and annual clinical exams with my physician. Even after I knew I had cancer and the location of the tumor, I could not feel it. I know that there’s a concern about over treatment of breast cancer but as it turned out, I had four invasive tumors. Given that the growth of cancer is progressive, I would have preferred to learn about my cancer earlier rather than later. I suspect that just as we do during different identity transformations in our lives, as breast cancer patients, we try on different concepts and struggle against outside definition from others until we feel weave a new spider web that makes sense, one in which we are connected with others but recognizable as the unique individuals we are.